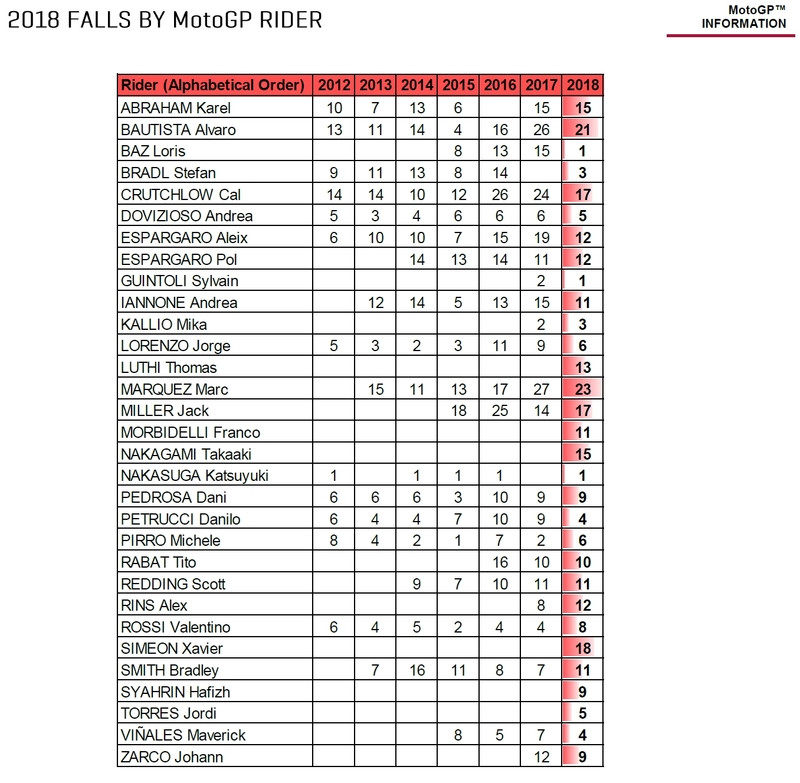 Marc Marquez reduces fall tally in 2018, but once again hits the ground more than any other MotoGP rider. 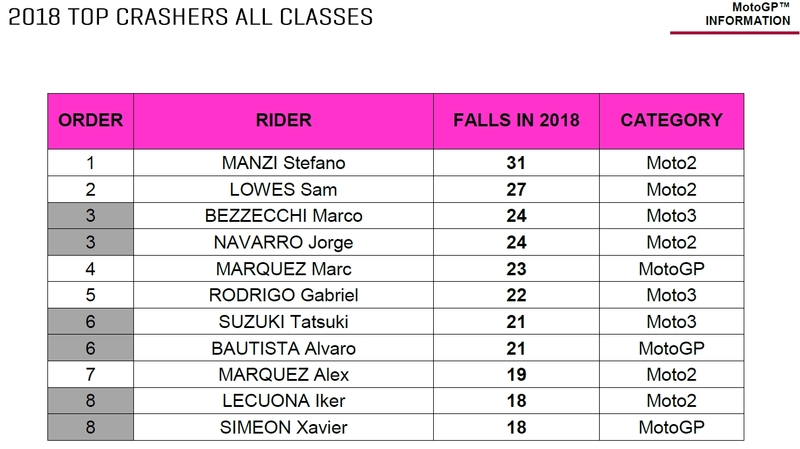 Stefano Manzi heads crash list in all classes. Marc Marquez won his fifth MotoGP title in 2018, but official season statistics show that he also fell 23 times along the way, once again more than any other premier-class competitor. That figure, compiled by MotoGP.com, only includes instances where the bike remained on the ground and so doesn't count the many spectacular saves made by the Repsol Honda rider. Marquez unsurprisingly hopes the RCV can be more rider-friendly in 2019, although HRC will take some comfort from at least lowering the 27 falls suffered by Marquez last year. Two accidents behind Marquez on the 2018 list was Alvaro Bautista (Aspar Ducati). Xavier Simeon (Avintia Ducati) was third on 18. Danilo Petrucci (Pramac Ducati) and Maverick Vinales (Movistar Yamaha) had the least accidents of the full-time riders, with just four each. Marquez was fifth on the crash list in all grand prix categories, which was headed by Moto2 riders Stefano Manzi (31) and Sam Lowes (27). Marco Bezzecchi topped the Moto3 class with 24 tumbles. 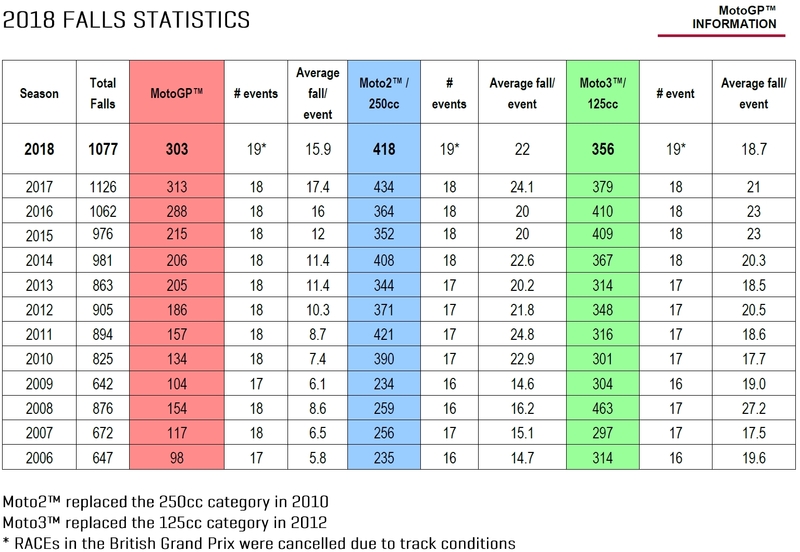 In total there were 1,077 falls this season, the lowest since 2015, despite more track sessions than ever before courtesy of practice and qualifying for a 19th round, although there were only 18 races due to Silverstone cancelled. 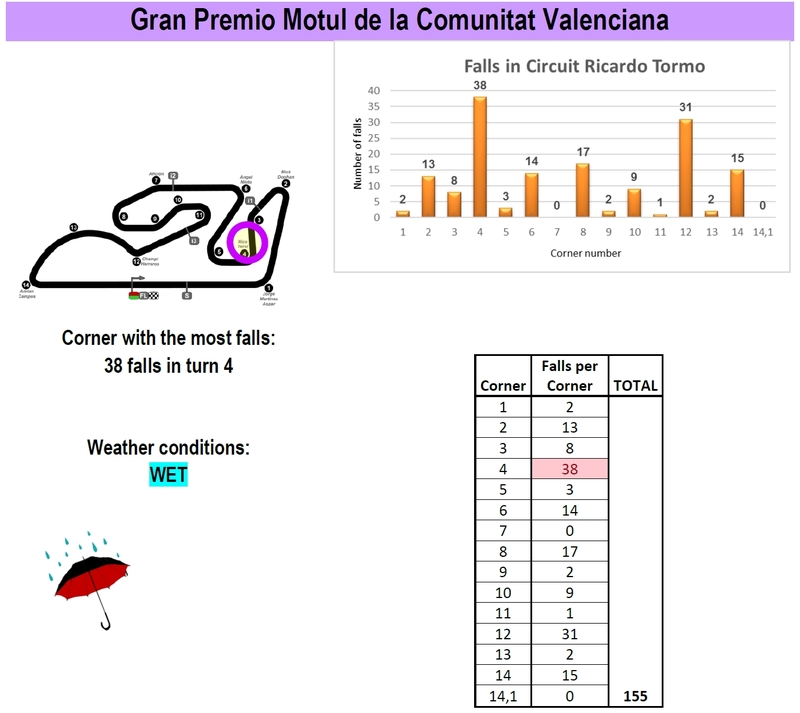 The wet Valencia season finale was by far the most treacherous round of the season with 155 falls, with Le Mans and Barcelona the only other rounds over the 100 mark. The most dangerous corner on the calendar, in terms of number of accidents, was turn 4 at Valencia with 38 incidents, followed by turn 12 at the same circuit (31).